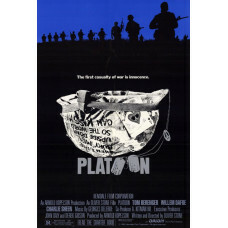 Platoon Movie Poster 27 x 40. A grunt's view of the Vietnam War is provided in all its horrific, inexplicable detail. Sheen is wooden in the lead, but both Dafoe and Berenger are resplendent as, respectively, good and bad soldiers. Strong, visceral filmmaking from fearless director Stone, who based the film on his own GI experiences. Highly acclaimed; considered by many to be the most realistic portrayal of the war on film.